A recent line of inquiry has led me down a research rabbit hole — a tunnel falling straight into the world of Southern Jewish cemeteries. Many of us are familiar in one way or another with Jewish cemeteries. We’ve been to funerals, placed stones on grave sites, or wandered through looking for familiar names or symbols. But until recently I was truly unaware of the logistics, preparation and business behind running a cemetery. I knew that most small Jewish communities started out not as full-fledged congregations coming together for worship, but rather often began as burial societies, brought together by the obligation to follow specific procedures for handling the dead. But I hadn’t considered that these days, the responsibilities of managing a cemetery are shouldered by dedicated congregational committees, or as I’ve come to hear as a common refrain — the “one guy with the records.” It takes a very specific set of skills to act as a landowner that sells burial plots; despite the specific skills and knowledge required, even the smallest of congregations have dynamic, dedicated locals who manage the arrangements. Arrangements that will be tested by time over and over again, because a cemetery plot is forever. The small amount that someone pays for a plot is meant to secure perpetual care for eternity, and eternity is a long time! In a recent episode of one of my favorite radio shows, Planet Money (having to do with — you guessed it! Cemeteries), I was surprised to learn that the concept of an eternal resting place is not universal. Tonya Marsh, author of Cemetery Law and the fascinating Funeral Law Blog, explains in many crowded European countries, graves are recycled. People typically buy the right to use a grave for a particular period of time, 20-100 years. When your reservation is up, the grave is exhumed and remains go into an ossuary, or “bone house,” making the spot available for the next burial. There isn’t the trouble of wondering what will happen to the property when the last plot is sold and the money runs out. But when people began to colonize the United States, land was abundant and permanent plots became standard. While this practice doesn’t align with the Jewish laws of honoring the dead (exhuming a grave is not allowed), her sentiment about the permanent place does resonate with the challenges Jewish cemeteries in our region. When the congregation decides to close its doors, and the last members are gone, who will be responsible for those left behind? If done correctly, the cemetery fund has been invested wisely. The small amount of money for a plot gets invested in a trust that should last the tests of time. It should last when the banks get sold or the economy falters. The legal documents should protect the sites, forever. Marsh suggests that making that legal promise, to do something forever, is somewhat irresponsible and doesn’t account for the unexpected. The unexpected, like when part of your cemetery becomes a national park. 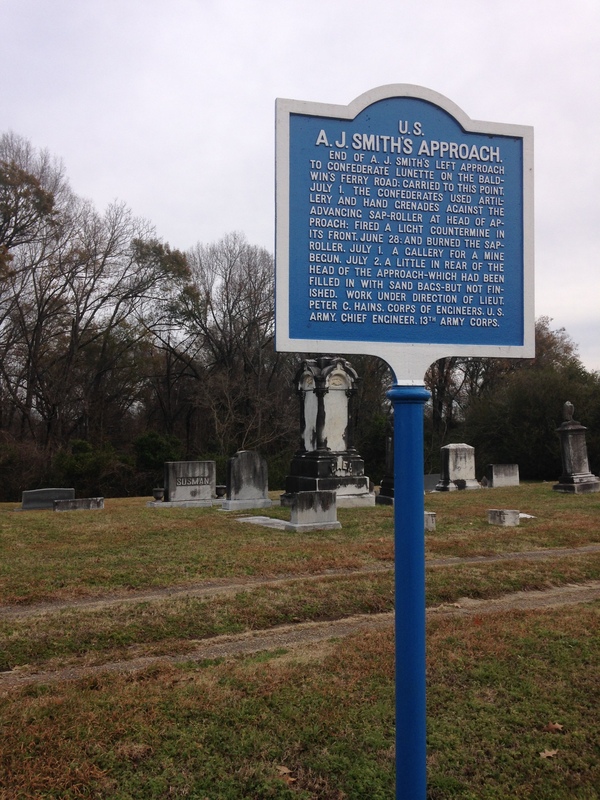 For example, on a recent trip to Vicksburg, Mississippi, Rabbi Jeremy Simons and I visited with congregants, toured the historic Anshe Chesed synagogue there, and walked through their cemetery, which has it’s own unique history. Vicksburg was the fortress city that dominated the last Confederate-controlled section of the Mississippi River during of the Civil War and after the battle; the fields were torn with scars of war and was left undesirable for development. The Jewish congregation at the time bought the land to be used for their cemetery. 40 years later, the Vicksburg National Military Park was established to surround the cemetery. The historic cemetery is a sacred place to honor the history of the congregation, the names and intricate headstones represent the long legacy of Jewish life in town. All the while, large National Military Park markers are scattered throughout, marking battle events to show what happened on the property before it became the permanent resting place for the Vicksburg Jewish community. The congregation still operates and maintains the cemetery, and they consider the National Park Service good neighbors. But what happens when the congregation isn’t around? What happens when there isn’t anyone left to give the tour, to mow the grass, to open the gates? What happens when someone is interested in buying a vacant plot, but there isn’t an active Jewish congregation to broker the sale? I’ve been scribbling these questions on my notepads lately and I’m now somewhat familiar with jargon about trust funds and perpetual care. There are answers. Here at the ISJL, we consult with congregations considering de-consecrating their synagogues on how to take care of their artifacts and archives. We work with organizations like the Jewish Community Legacy Project, which provides services to make sure all the right questions are asked and answered to ensure the legacy of the community into the future. 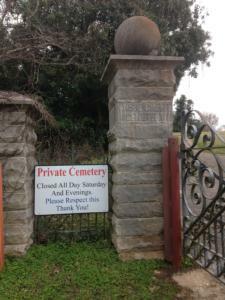 Cemeteries can’t ever “close their doors,” so how do we continue their care? That’s one of the areas I’m learning more about these days. An active congregation sells plots and invests in trusts, to ensure perpetual care for the cemetery. In that sense, the business of a cemetery sounds a lot like a metaphor for Jewish life. Congregants hope that by investing in a congregation, a religious school, a Simchat Torah celebration, that the investment will ensure Jewish life in that community…forever. I’m clearly in the very early stages of this new life long learning project. I’m inspired by the people I’ve spoken with along the way who are dedicated to maintaining Jewish cemeteries, and I’m interested in hearing from y’all. Do you know who is managing your congregation’s cemetery? (If so- you should give them a high five!) Do you live in a small town (Southern or otherwise), and/or do you have an interesting cemetery anecdote or challenging conundrum? Let’s continue the conversation in the comments below!